The Luxury Travel Diary site dropped me a line about another wave of its luxury auctions closing this week. These are often worth a look as there are often deals to be had. Packages closing soon include two Maldives deals and packages in Portugal, Tuscany, Playa del Carmen, Qatar, Bali, Singapore and Greece. As usual, it is worth having a look to see if anything takes your fancy. As part of a major global lounge overhaul, American Airlines has temporarily closed its arrivals lounge in Heathrow Terminal 3. It will re-open in the Summer. Until then, any eligible passengers arriving in Terminal 3 on a BA, Qantas, Cathay Pacific or American flight can use the British Airways arrivals lounge in Terminal 5. Whether you would want to go to all that trouble is a different question! The BA arrivals lounge is open until 2.30pm daily. 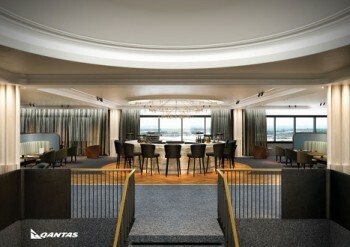 Qantas has decided to build a dedicated lounge in Heathrow Terminal 3. This will offer yet another option for eligible British Airways passengers flying from T3. They can already choose from the BA lounge, the AA lounge, the Cathay Pacific lounge (currently closed for refurbishment) and, if they have access, two Priority Pass options. The specifications sound excellent and the drawing above looks good. It will be a large space, seating 230, occupying the area previously used by SAS. Opening is pencilled in for early 2017. If Qantas make the lounge anything like HKG, or even like their domestic lounges at MEL and CBR, I will ignore the BA lounge and hop between QF and CX. Double check the fine print and the value of the luxury travel deals – e.g. one of the Maldives one I saw for an Oct date I could do it was actually cheaper to book direct than pay the current bid price! It should be noted that CX are not offering an alternative arrivals lounge during the AA closure. AA will also be expanding the lounge with the addition of some previous QF office space. OT Bit: virgin trains west coast started a three day sale today. Re lounge closure in T3, with T5 lounge as an alternative – how does changing terminals during a layover affect things like security/passport control? I thought once you were in a particular terminal you were stuck there until you board your connecting flight. Arrivals lounges are past immigration in the arrivals area so in this instance you would need to take the free terminal transfer on the Heathrow express. If you have a connecting flight you would use the regular lounges airside. On a related point i assume that ‘airside’ terminal transfers for lounge access is not allowed? I.e. Have status for an airline flying from T2 but departing T5. Anyone ever tried this either home or abroad? Ah, I didn’t appreciate the distinction between an “arrivals” lounge and other (departure) lounges. Thanks. So BA change my LHR terminal from T5 to T3, now there is no arrivals lounge at T3 for a while. Can that be right? Sorry, I should have said for my flights to/from Cape Town. The AA arrivals lounge wasn’t exactly a must see….Can’t swing a cat insured or not. Although on the upside the showers were a big step up from the frankly pretty dire BA T5 ones! Off topic however it would appear that Crowne Plaza Ealing has released their entire inventory including feature club rooms for reward nights. It wasn’t like this the other day so possibly an error. Have just booked a feature club room for FA Cup final weekend at 30k a night. Spotted this too and booked a feature club room yesterday. Have not stayed there before, is it a good standard generally for a CP? any idea how long the CX lounge is closed for? Yes, I came across that story a couple of weeks ago. Not quite sure what to make of it all really. I mean we all do ex-eu but booking those as a travel agent for people in the UK seems slightly naive. No point regurgitating the thread I guess but it’s 100% obvious BA will definitely NOT start chasing individual customers for the difference between a fare priced ex-UK vs a flight priced ex-EU when they miss the last leg of the ex-EU flight. So just book direct with BA. As you say, no point regurgitating but in theory could they not close down your BA exc account?